How do I search URSUS? How do I request an item in URSUS? What if a title is not available in URSUS (Maine InfoNet)? URSUS is the online catalog of the University of Maine System Libraries as well as the Maine State Library, the Maine State Law and Legislative Reference Library and the Bangor Public Library. It also is a means to connect to other libraries in Maine as well as nationally. URSUS is where you look for books for your research, but it also includes library records for audiovisual material, maps, and government documents. To start a search, at the URSUS home page, you can click on any of the search options. Keyword: searches by the exact word(s) you enter into the search box. Looks for the word(s) in a title, subject heading, author's name, description,and notes. Title: searches for the exact words in a title in the exact order that you enter the words in the search box. Author: searches for the works written by an author. Type in the author's last name first. Subject: searches material by the official words or phrases assigned to the item. Here are the results of a search by subject on the topic "distance education." The first item on the list is telling the user that there are 7 other subjects that relate to this topic. It is a good idea to look at these as they can be used as further search terms. The second item on the list is a link to all the library records that can be accessed with your original search term. All of the remaining items, beginning with Number 3, break down the search topic into narrower topics which limit and focus the search. citation information (author, title, publisher, edition). shows the "Call Number" of the book -- where it can be found in the library. shows the "Status" of the book -- available, due date, on order, etc. How do I request items in URSUS? 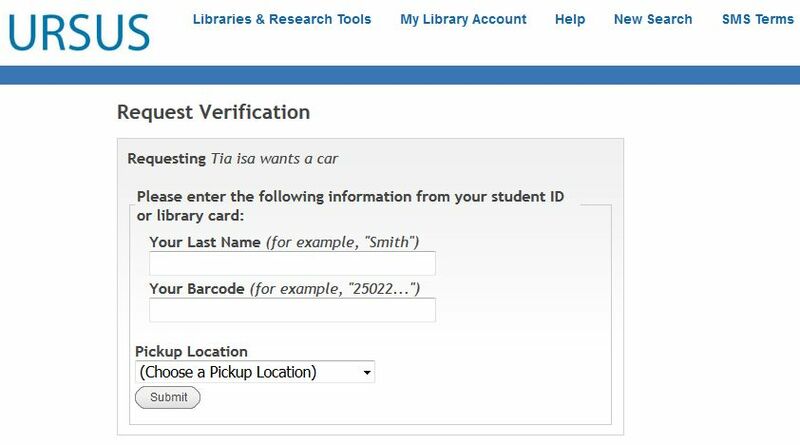 First you will need a valid University of Maine System library card to request items found in the URSUS catalogue. Campus-based students should go to their campus library to have their library barcode activated which is often imbedded on the back of your picture ID. Off-Campus students can obtain their cards from the Off-Campus Library Service office using the Library Card Form. Paper copies are also available at University Centers and Sites. Once you identify material that you would like to request, click on the "Request" bar at the top of the screen. You will be asked to submit your name, library barcode number, and select from the drop-down menu the University Campus, University College Center, or Site where you will pick up the item. You then submit that information by pressing on the "Submit above information" button. Note: Some items in URSUS have the status of "available," but cannot be ordered. They may be restricted to on-campus use or may be part of a special collection. What if a title is not in URSUS or is not available when you need it? If a title is not available in URSUS, you can click on the Search MaineCat button on the top of the screen. Your search will be repeated in the MaineCat system to see if this title is available from another library in Maine. The search gives you the option to see which libraries own a copy of the book and the option to request the item. Remember that requesting an item from a library outside the University of Maine System will take a bit longer for mailing time. Plan accordingly! When requesting, the first screen will ask your library group affiliation. University of Maine System students should select URSUS. You will next be asked for your name and library barcode. Then, from the drop down menu, select your Campus, Center or Site where you will pick up the book. Then submit the information by pressing on the "Submit above Information" button. The system will confirm your request.